For over a decade, Rhi has treated many hundreds of clients from all walks of life, from children and office workers to weekend warriors and active seniors. Her greatest joy is in helping those she serves in Perth CBD; she’s an invaluable asset to Central City Physiotherapy. Rhi studied at Brunel University in West London, qualifying in 2004. She began her professional vocation working in the NHS in the UK. It was during this initial phase of her career that her interest in musculoskeletal physiotherapy blossomed. She worked as a senior in specialist rotation, and her knowledge expanded to include outpatient orthopaedics and rehabilitation. Over the years, Rhi has made it a priority to keep abreast of new technology and advanced techniques in her field. 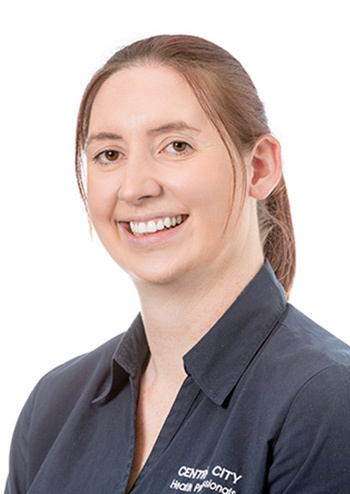 She’s an expert in the treatment of complex shoulder pain and is qualified in dry needling, Clinical Pilates and spinal biomechanical assessment and treatment. Rhi loves the outdoors and physical activity. She’s a member of a local soccer team, a season ticket holder for the Wildcats and participates in 5K runs. You can find her running in Claisebrook Cove every Saturday morning. Give us a call to see how Central City Physiotherapy can help you or someone you know.